Software development practices change over time, so do the tools and technologies. Such changes aim to improve productivity, quality, customer satisfaction, to tackle ever-shorten delivery time, and to deliver successful products and services. Software testing obviously plays an important role in achieving these objectives. 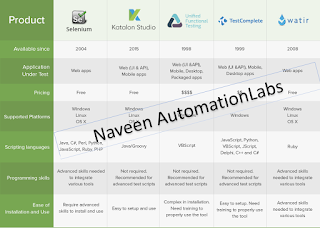 In the test automation landscape, automation tools certainly take a center stage. This post summarizes the top test automation tools and frameworks that have the potential to help organisations to best position themselves to keep pace with the trends in software testing. The list includes both open-source and commercial test automation solutions. Selenium supports multiple system environments (Windows, Mac, Linux) and browsers (Chrome, Firefox, IE, and Headless browsers). Its scripts can be written in various programming languages such as Java, Groovy, Python, C#, PHP, Ruby, and Perl. While testers have flexibility with Selenium and they can write complex and advanced test scripts to meet various levels of complexity, it requires advanced programming skills and effort to build automation frameworks and libraries for specific testing needs. Katalon Studio is a powerful test automation solution for web application, mobile, and web services. 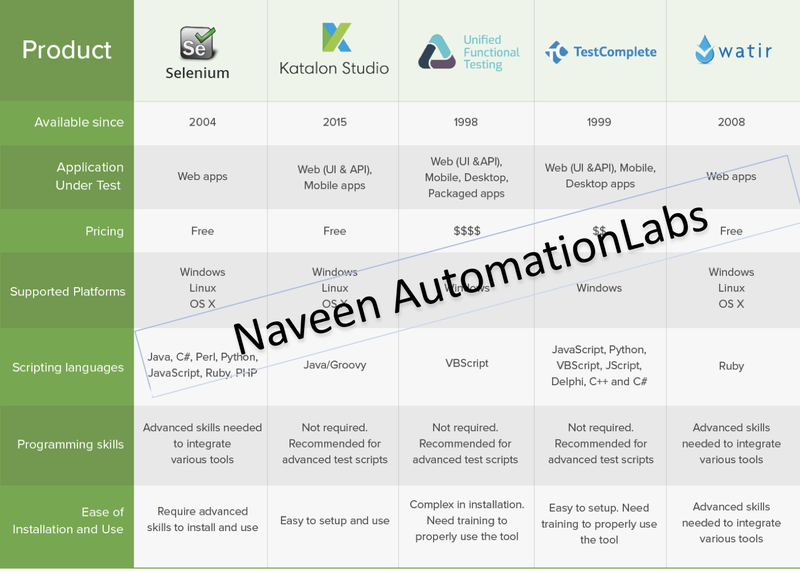 Being built on top of the Selenium and Appium frameworks, Katalon Studio takes advantage of these solutions for integrated software automation. The tool supports different levels of testing skill set. Non-programmers can find it easy to start an automation testing project (like using Object Spy to record test scripts) while programmers and advanced automation testers can save time from building new libraries and maintaining their scripts. Katalon Studio can be integrated into CI/CD processes and works well with popular tools in the QA process including qTest, JIRA, Jenkins, and Git. It offers a nice feature called Katalon Analytics which provides users comprehensive views of test execution reports via dashboard including metrics, charts, and graphs. UFT uses Visual Basic Scripting Edition to register testing processes and object control. UFT is integrated with Mercury Business Process Testing and Mercury Quality Center. The tool supports CI via integration with CI tools such as Jenkins. Watir is an open-source testing tool for web automation testing based on Ruby libraries. Watir supports cross browser testing including Firefox, Opera, headless browser, and IE. It also supports data-driven testing and integrates with BBD tools like RSpec, Cucumber, and Test/Unit. Another interesting feature of RFT is its integration with IBM Jazz application lifecycle management systems such as IBM Rational Team Concert and Rational Quality Manager. Like UTF, TestComplete’s GUI object recognition capability can automatically detect and update UI objects which helps reduce the effort to maintain test scripts when the AUT is changed. It also integrates with Jenkins in a CI process. Tricentis Tosca is a model-based test automation tool that provides quite a broad feature set for continuous testing including dashboards, analytics, and integrations to support agile and DevOps methodologies. Tricentis Tosca helps users to optimize the reusability of test assets. Like many other test automation tools, it supports a wide range of technologies and applications such as web, mobile, and API. Tricentis Tosca also has features for integration management, risk analysis, and distributed execution. Ranorex is a quite comprehensive commercial automation tool for web, mobile, and desktop testing. The tool features advanced capabilities for GUI recognition, reusable test scripts, and record/playback. Codeless test creation is also a very useful feature that allows new automation testers to learn and apply test automation to their projects. Test engineers can leverage Robot Framework as an automation framework for not only web testing but also for Android and iOS test automation. Robot Framework can be easy to learn for testers who are familiar with keyword-driven testing. World Quality Report 2017–2018 by Capgemini, Sogeti, and Marco Focus. Awsmm blog Naveen! thanks for sharing! I need your guidance.kindly guide me. One information needed.If you are having any knowledge kindly share.I don't have any knowledge,I hope LL help me in this confusion. I got one project which was basically automation with C# with CodedUI and Visual studio. In this project ,I am having scope of learning automation testing with CodedUI and mobile automation and API automation testing. Note:-So what should I do?? Should I accept this project?? If I worked in this project what about my future growth.